As exciting as the concept may be, internally weve been skeptical about Vive X company TPCASTs wireless solution for the HTC Vive since its announcement last month. We have so many questions: how is it set up, is it too heavy, does the battery last long enough and, most importantly, whats the effect on latency? Last week, we got to answer some of those questions for ourselves. TPCAST visited UploadVR last week, and we got extensive hands-on time with the kit. 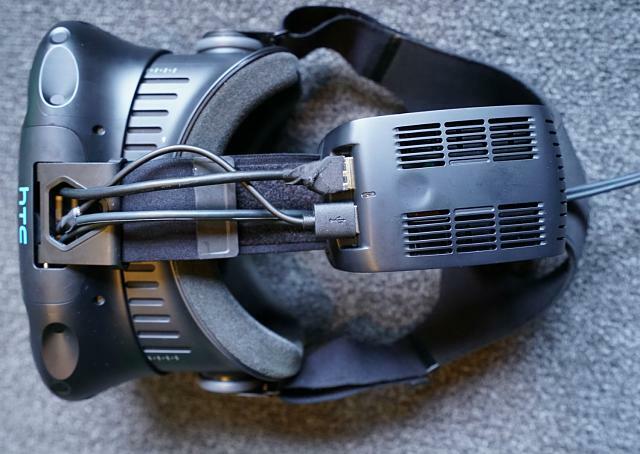 We used a Business Edition of the Vive supplied by TPCAST that had a receiver attached to the top of the head strap. It connected via short cords to the headset. 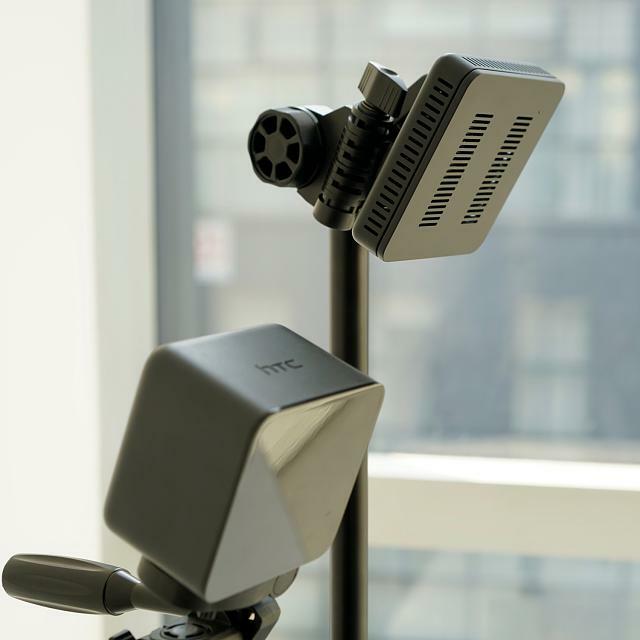 Along with the usual two lighthouse stations, there was a TPCAST video transmitter which was said to have a 160 degree field of view mounted high in the room facing the play area. The company said the transmitter is best set above the play space in the middle pointed downward. For our testing, the play space was 4 meters by 2.6 meters. TPCAST claims it can cover a 5 meter by 5 meter area with ideal conditions. There was also a router connected to the PC which we were told was for the transmission of movement data. TPCAST says for the consumer version that unit will be reduced down to a dongle attached to the PC. To power the headset, a battery pack was slotted into a back pocket with a cord running outside my shirt to the backside of the headset. Two versions of the kit are said to be going on sale in China next year, and we tried the version with the bigger battery life, said to last five hours. Our playtest with the headset lasted just about that long (ignoring the time spent restarting SteamVR and rebooting things) but well have to stress test it with the consumer version to give you a more accurate reading of their claims. 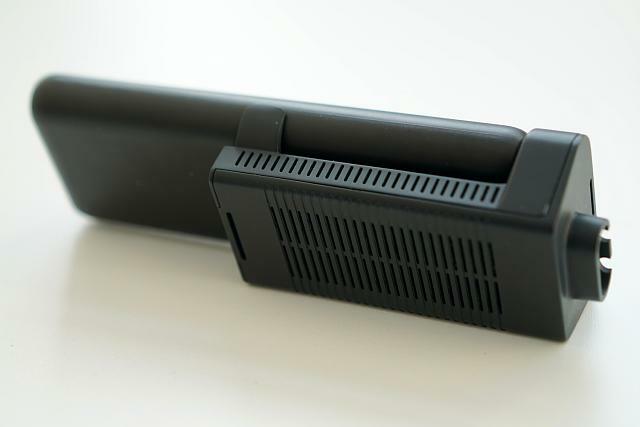 A version with a smaller battery that attaches on top of the head with the receiver, and is said to last up to two hours, is what was made available for pre-order already. Everything we tried was running on our Falcon Northwest Tiki (4 Ghz i7 PC with a GTX 1080), though we also sampled the kit on a laptop TPCAST brought along with a 1070 stashed inside and found identical results. Does TPCasts Vive Wireless Upgrade Kit Work? Based on our five hour play session which ran the battery flat it appears that it works as promised. We didnt notice any difference in motion to photon latency while sampling VR experiences like Google Earth VR, Tilt Brush and Valves The Lab. We were able to move around with complete freedom, including fast movements like jumping and flipping. Yes, we even brought in a gymnast to test some extreme movements possible only with this wireless positionally tracked headset. Even with accidental drops of the headset, receiver, and the prototype transmitter, it all still worked. There were, however, instances where we noticed artifacts in the virtual scene, which momentarily reminded us that the headset was indeed wireless. These artifacts, which looked like a lower resolution streaming video, were momentary and mostly negligible to the overall experience of enjoying completely wireless room-scale VR. The artifacts were also hard to replicate by repeating movements or positions that we suspected mightve been responsible for causing them. The most prevalent technical difficulties we dealt with was the connection between the physical wires on the headset, the receiver, and the battery pack. One of our testers, a gymnast, did some ridiculous physical maneuvers, such as flips and handstands, and at one point the unit fell off his head mid-flip. The TPCAST crew were able to get the headset back up and running quickly. While we had enough time to quickly film these insane physical movements with the wireless headset, we unfortunately didnt have the time to set up a proper test that would have used both a wired Vive and a wireless one to see if people could tell which was which. I have spent hundreds of hours in wired Vives over the last year and I did not notice any latency differences between the headsets Ive been using and this wireless one. We plan to do extensive testing with the consumer version of TPCAST when it arrives to fully examine the latency numbers, but for now, we found the overall motion to photon latency feels way under the 20 ms benchmark required for comfortable VR headsets. It seems the location and setup for the transmitter will prove to be a crucial detail in having a seamless experience, similar to finding the right places to mount the Vive lighthouses. TPCAST says that the transmitter can be mounted above the lighthouse to minimize the overall real estate taken up by trackers around the house. To get the best results, however, youll need to have the transmitter in the middle of the play space facing downward, according to the startup. Dealing with forms of wireless interference could be another potential headache, but we didnt see the headset having issues despite how much metal we had in our room (tripods, lights) as well as wireless mic systems. The headset felt lighter with the receiver on that it does with the Vives thick cables pulling at the back of your head when tethered to a PC, and I didnt note extra heat on my head during my playtime. Thats another question weve long wondered about, and something TPCAST CEO Michael Liu helped answer. He described the kit as a bi-directional communication portal. It uses a compression algorithm described as the companys secret sauce with Wireless HD transmission we believe to be in the 60 ghz wifi band sending 2160 x 1200 video data. Input like head and hand movements are transmitted via the router, while video transmission is handled with the overhead transmitter, according to the company. Its important that the transmitter is placed high up to give it a view of the entire play area youre using so that in most cases the user shouldnt feel any dead angles. Liu wouldnt, however, promise that anyone that picks up the tech would be able to get it to work in their homes if they have a lot of interference around. This is a complicated technology, he said. We will do our best. Liu said it would be very easy to set up. Developing the tech obviously came with its fair share of challenges, the biggest of which Liu said was keeping latency low. Currently TPCAST claims it adds less than 2 milliseconds of delay. The latency that we talk about is actually our latency, latency cost by our wireless device, Liu explained, meaning it stacks on top of the latency already involved with using VR headsets. As for concerns about the safety of using such a device, Liu wasnt worried. I think wireless communication, the receiving part is actually okay, he said. I think a cell phone is more trouble. 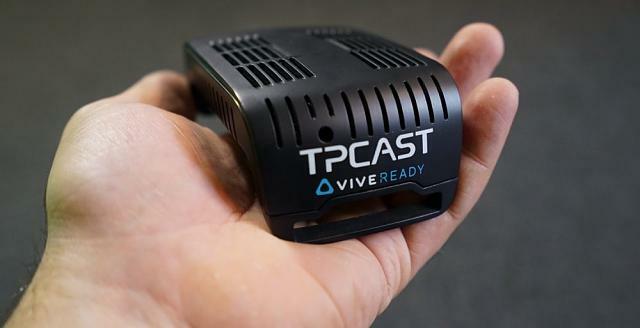 TPCAST itself has been specializing in making technology wireless for the past five or seven years, though the Vive kit has only been in the works for the last year. We started the project as an internal project because sometime last year we saw this big opportunity, this big wave of VR coming, Liu explained. The Vive kit got off the ground after a meeting with Alvin W. Graylin, China Regional President of Vive at HTC. Following that, TPCAST was one of the first companies to be inducted into HTCs Vive X accelerator program, giving companies access to resources, working space, and mentorship as well as investment opportunities through other programs like the VR Venture Capital Alliance (VRVCA). HTC itself was one of the first outside investors in the company. hinese pre-orders for the kit opened in November and sold out very quickly. Liu declined to reveal how many units were sold in that first batch, though did promise another batch is coming and that the company will be demoing at CES next year. TPCAST is planning to ship the kit in China in Q1 of 2016, and its not possible to pre-order it internationally just yet, though Liu said it is in the certification process for the FCC right now. As for a launch in the US, all Liu would offer is sometime next year. A US price for the kit has not been set. Liu also told us that TPCAST has support for other headsets on its road map, though it was hard to say when it could turn its attention to those other products. TPCAST is working on a version of the Vive kit that outputs in 4K too, which is likely to future-proof the device for when new headsets support that resolution. This is exciting, hopefully this means built in wireless headsets will be a thing in a few years, even if we have to have a pocket or waist mounted battery pack. Just read that article too. Seems really promising. Hopefully it will eventually become the norm and maybe be built in with the next iteration of the vive. My question is can you wear over-ear headphones along with this part that attaches to the top of the headset? I am guessing no unless that TPcast part can be moved forward a bit. That's a good point. I usually have my headphones tilted toward the back part of my head because I like the wires on top to have a bit of slack. A few things that I myself would want to be cleared up before purchasing one. It's not clear to me how it even attaches as the straps don't detach? Will supersampling choke the bandwidth? I would like to see it tested when not mounted centrally above play space. It's not very practical like that. Yep. A lot of things have to fall into place before it is a sure thing. Maybe it is not as big as the photos look and it can be moved further up. I got a set of Ossic Xs on the way, so I have to have some way to use them with this. I was wondering about that too, what you suppose to do with the long ables while you can't simply cut it or detach it. maybe with the released device kit you will be able to connect the HDMI, USB and Audio cable to a device and put aht device on your pocket or something. Another thing will be the real price when released. I don't know if it was this unit or another one but someone was saying you would have the battery unit in your pocket so I guess you could loop of the cable and plug them in there. It isn't actually a bad idea. In the video they talk about it, you put the battery in the back of the Headset or in your pocket, but would be nice to no be with 10ft/3mts of cables with you, of course is way better that having the cable connected to the PC. Well are the Vive cables detachable? If so I would guess you can just plug in short cables? They are. Just a matter of finding cables that short if you go that route.